The tendon is the end part of a muscle that attaches into bone. Tendonitis (tendinitis) can occur anywhere in the body but is very prevalent in the foot. This discussion will deal with the most common types seen in the foot. This condition can occur for any number of reasons. Usually it is due to an over repetitive action of some kind such as might be the case in a runner. Irritation of the tendon tends to become more prevalent as we age because our tendons lose some of their elasticity; the ability to move in response to the action that is required of the muscle. In most instances the patient will be able to relate to a specific incident that caused the tendon pain, but many times a patient will come in complaining of pain in a certain part of the foot with no history of trauma or excessive activity. It is usually upon questioning that the patient will relate that they spent yesterday carrying boxes up and down the stairs, as an example, but they did not make the connection to the activity and subsequent pain. Other times, it may not be that obvious. I have had patients who have just gotten back from vacation and all of a sudden their foot hurts and it never dawned on them that it might be from walking long distances in an airport carrying heavy items. Generally, an x-ray should be taken to rule out any bone abnormality; the x-ray is of little value in viewing the tendon itself. immobilization of the foot is always indicated and depending on the degree of pain and its location determines how much immobilization. Sometimes an ace bandage is all that is necessary, other times a cast and crutches may be necessary. Again, it’s the same old problem with the foot; every time you take a step you are re-injuring an injured area and so foot problems tend to take longer to heal compared to other areas of the body. If the affected area does not improve substantially within a reasonable period of time an ultrasound or MRI may be indicated to rule out a tear within the tendon or even a partial rupture at the attachment of the tendon into bone. When we talk about tendinopathies (pathology within tendons) it can be further broken into tendonitis which this discussion covers which implies an acute inflammation of the tendon. It is important to mention the other type of tendinopathy is tendinosis which is a chronic pain occurring in a tendon with no overt inflammation but degeneration of the tendon instead. Both conditions will yield pain but the treatments offered in the previous paragraphs will only be effective in tendonitis because they attempt to reduce inflammation. In tendinosis there is no inflammation but instead the pain being caused by degeneration of the tendon will not respond to the above treatments. The point to take away from this is that acute tendon injuries should be treated immediately. Delaying treatment may lead to a tendinosis and in those instances the only treatment is surgical intervention where the diseased tendon is repaired with an attempt to reintroduce the inflammatory phase. In theory tendonitis can occur at any tendon but it seems to me over the years people come in with complaints of pain indicative of tendonitis in five places on the foot. Below is a picture of two common sites for tendonitis. extensor tendons- The first site by the blue arrow represents what we call extensor tendonitis. The tendons pictured here are the tendons that bend the toes upward. People will usually not relate any history of trauma or excessive activity in this type of tendonitis. The top of the foot will be very tender, mildly swollen, and possibly slightly red. Touching the area and certainly bending the toes down will cause pain. Keep in mind that a stress fracture of the metatarsals can mimic these symptoms. Click here for more information on fractures. peroneus longus tendon- The second site at the yellow arrow represents an irritation of the peroneus longus tendon. Whoever designed us really did a lousy job when it comes to this tendon. (I guess at the time no one ever thought man would wear shoes and walk on concrete). What happens with this tendon is that it comes down the outside of the foot and then makes a sharp turn underneath the foot and ends of attaching on the inside of the foot. It is a tendon that is used to stabilize the foot during the gait cycle. The problem occurs where the tendon makes the sharp turn. As the tendon moves it slides across the bone (cuboid) and therefore can be easily irritated. Of course this can happen in athletic people, also in people who do a lot of walking on hard surfaces. The one common denominator that most people do not realize is the shoe that they are wearing. In many instances a shoe that is too narrow causes this tendonitis. What happens is that this particular part of the foot “overhangs” the outer sole of the shoe and the sole itself begins to irritate the tendon as it is passing under the cuboid bone. This will occur primarily in dress shoes, especially stylish dress shoes. That is why many times the patient will relate that they feel somewhat better in sneakers because most sneakers are not too narrow at that level of the foot and the sole is a cushioned type sole. The obvious treatment is to try on your shoes and not wear the ones where the outside of your foot is overhanging the outer side of the sole. Even with removing the harmful shoes, this problem can take a while to resolve since you are still walking on the tendon every step you take. In addition to the previous mentioned treatments for tendonitis, sometimes a cortisone injection along with special padding inside the shoe will finally resolve the problem. Below is another picture of the tendons of the foot. 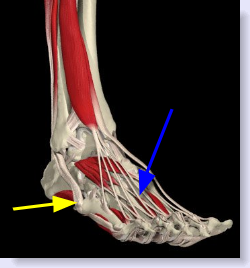 Achilles tendon- The blue arrow is pointing to the Achilles tendon. This may be the most common site of tendonitis in the body. Again, generally over-exertion will irritate the tendon as it attaches into the heel bone. One of the biggest causative factors for Achilles tendonitis is a tendon that it is too tight. With your knee locked and foot extended attempt to bend your foot up using rope or a towel. If your foot and ankle form a 90 degree angle or anything less, you have a tight heel cord. Because of this any over stress to the tendon can either inflame it or in some cases rupture it. Women who have worn high heels their whole adult lives will find that they have tendonitis pain in the back of the foot when they attempt to wear flats or go barefoot. The reason for this is that over the years the tendon has tightened up (shortened) from wearing high heels. Men over the age of 40 are much more prone to Achilles tendon ruptures due the decrease in elasticity of the tendon past the age of 40. While on the subject of acute tendon ruptures it is worth noting that people on antibiotics of the Fluoroguinolone variety (Cipro) are also at an increased risk of tendon rupture and tendonitis. As a preventative measure I generally recommend to my older male athletes that they wear a one-quarter inch heel lift in both shoes particularly when they are doing anything athletic. Lifting the heel then takes some of the tension off of the Achilles tendon. 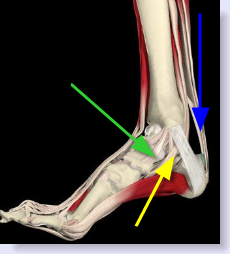 tibialis anterior tendon- The Green arrow represents tendonitis pain that occurs on the inside of the foot. This tendon, the tibialis anterior tendon acts to keep the height of the arch up. Too much pressure forcing the foot to flatten out such as chronic obesity, a strenuous athletic activity, etc. will cause too much tension on this tendon and it will begin to hurt usually at its attachment into the bone (navicular). Along with the usual treatment for tendonitis, an orthotic device to support the arch is very helpful, even mandatory, if the pain is ever to be resolved. By wearing an orthotic the tendon does not have to work as hard to support the foot. Click here for more information on orthotics. This condition is also known as adult acquired flat foot, also known as posterior tibial dysfunction, because as the tendon continues to weaken, the foot continues to further flatten. Initially there will pain and swelling on the inside of the foot near the ankle. As the condition worsens and the foot begins to flatten out more pain may develop on the outside of the ankle from the foot bone jamming into the lateral ankle bone. Additionally since the foot is no longer functioning in a proper manner degenerative changes will occur in the foot causing arthritic changes. Pain is not limited to the foot and ankle. Since the problem tends to be progressive it may also lead to knee, hip or back pain. In this case it is imperative that the underlying problem of the arch flattening out be addressed. If the condition is not too severe a prescription orthotic is indicated to take up some of the work of the poorly functioning tendon. More severe cases may require an ankle foot orthosis that holds the foot in proper alignment with the ankle to take more pressure off the tendon. In more advanced cases a non-weightbearing cast may be necessary in order to rest the tendon and allow it to heal. If these conservative treatments fail to remedy the problem, then surgical intervention may be indicated involving both the tendon and bone in an effort to stabilize the foot.